Test Your Bible Knowledge is everyting a lover of Bible trivia could ask for--challenging. . .educational. . .and entertaining! It's more than just another Bible memory quiz--recognition of actual facts is the key. A grand total of 1,437 fascinating Genesis-through-Revelation questions with multiple-choice answers are based on the beloved King James Version of the Bible. 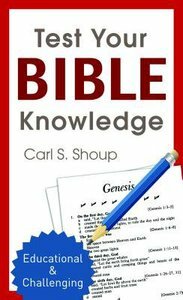 About "Test Your Bible Knowledge"